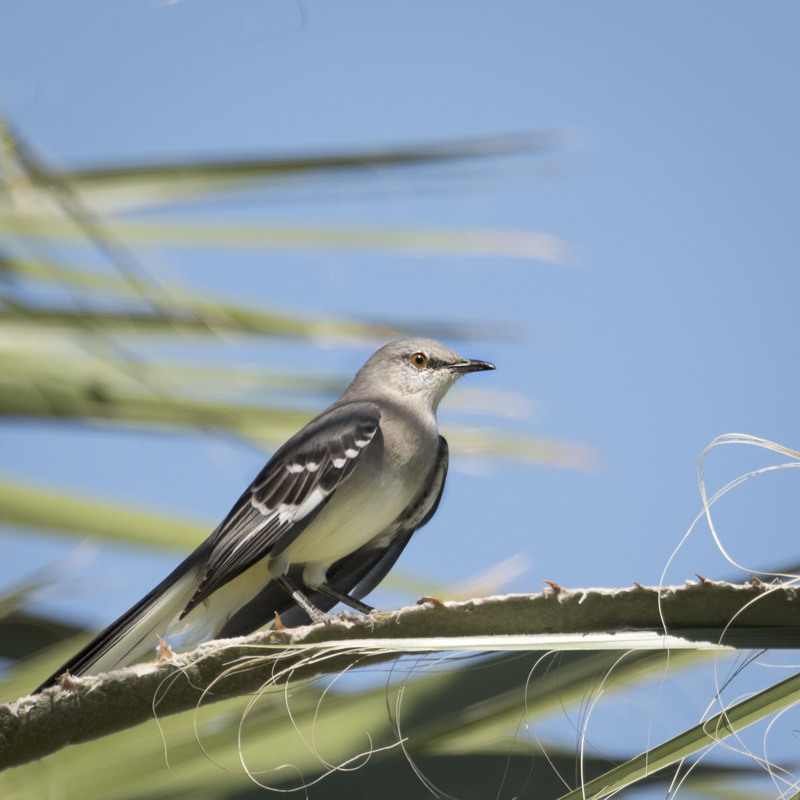 Not having Mocking birds around us or having much experience with them we were blown away when while getting some gas on a recent trip we heard this guy singing away in the trees at a roadside oasis. He was imitating birds left and right and singing continuously for minutes at a time. It was a great show to just sit and watch and a nice relaxing break from the road. Here in Tennessee, we have LOTS of mockingbirds! In fact, the mockingbird is the State Bird. They’re interesting–fussy, territorial, flogging songsters–They can sing anything! HI Diana, must be fun to have them around. DO they sing non-bird songs and mock other things as well? One of our favorite birds during the summer months is the Gray Catbird, a relative. Melanie calls her blog Catbird Quilt Studio. It has a large repertoire of songs and calls. It reminds us of a jazz musician lurking about in the shrubbery. HI Jim, we have the grey catbird here as well and the analogy of a jazz musician lurking about in the shrubbery is a good one. They tend to hang out in the marshy areas here and having them singing away while out on a walk is always a nice treat. How cool! I love mocking birds and grew up with them all around me in Austin. HI and thanks for the feedback. It is much appreciated. Here in California, you know spring is here as they sing day and night! HI,do they really sing all through the night? I have yet to be around birds that sing after dark and it must be quite a treat to have a songster like th mocking birds fill the evening with song. Well, they probably don’t sing “all through the night” nonstop, but there have been many times I have heard them in the middle of the night. Sadly, it seems over the past few years there are fewer of them. To me, they always tell me spring is on the way. Given the weird weather we have, I think everything is getting thrown off normal patterns. Do you k now if their numbers have decreased or they are just residing in a different location. It is special to see one of these super songsters so late in the season in Colorado. Well done, Mike! Thanks Tanja, we did not see this one in Colorado but in California. They are plain in appearance, and commonly seen nearly everywhere, but once you get a load of their playlist… a toast to the Mockingbird! Hi Paul, we don’t regularly see these guys in Colorado so for us it as indeed a special thing to hear this guy singing away for what seemed hours and a toast is indeed in order. I’ve always lived in warm, low altitude places, so my idea of “most everywhere” is a bit warped! Hi Jim, perhaps I am the one with the warped perspective as I have always lived in higher altitudes and colder climates. I only have limited experience with these birds and this guys songs blew me away. Hope to hear more someday. Superb portrait of this virtuoso of the bird world, Mike! Your bird photography never ceases to amaze me! This one is perfect!